This is my last post on my Bangkok trip in February 2012. 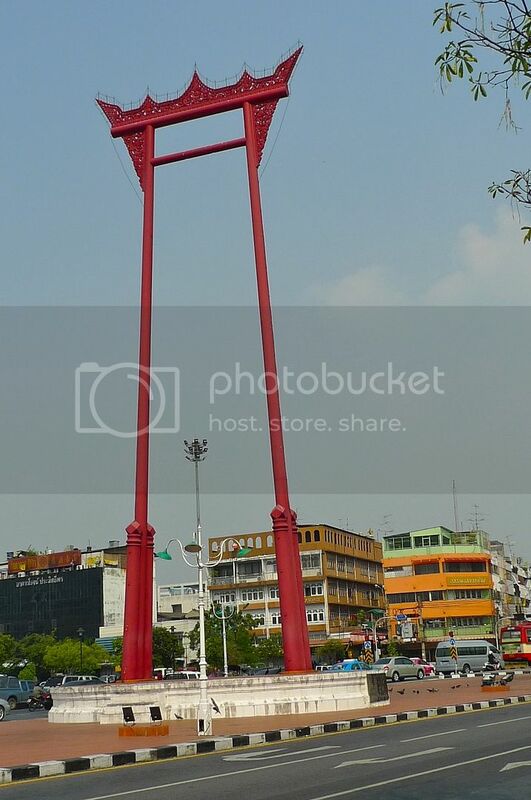 During this trip, I managed to visit the Giant Swing, a famous landmark in Bangkok. Located in front of the Wat Suthat Temple in Phra Nakhon district, this Giang Swing is actually a religious structure and formerly an old Brahmin ceremony. I am glad that this unique structure is well preserved. Although there are many shopping malls in Bangkok, one that I must visit every time I go Bangkok is Siam Paragon. 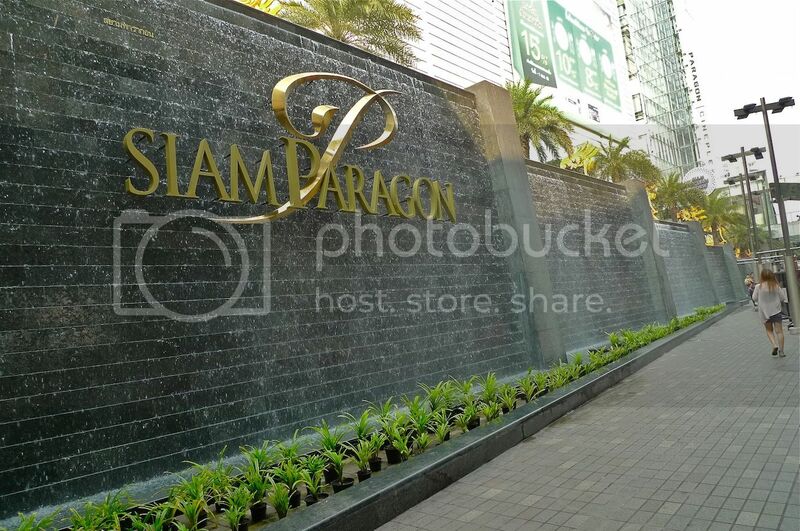 During this trip, I managed to take a shot of the Siam Paragon logo. I like walking along this lane watching the water streaming down the long stretch of wall. I don't normally visit fast food outlets like McDonalds in Bangkok, but this time I visited Burger King just to try their pork burger. Surprisingly, I did not take any photo of the pork burger but I took a picture of the outlet's interior. 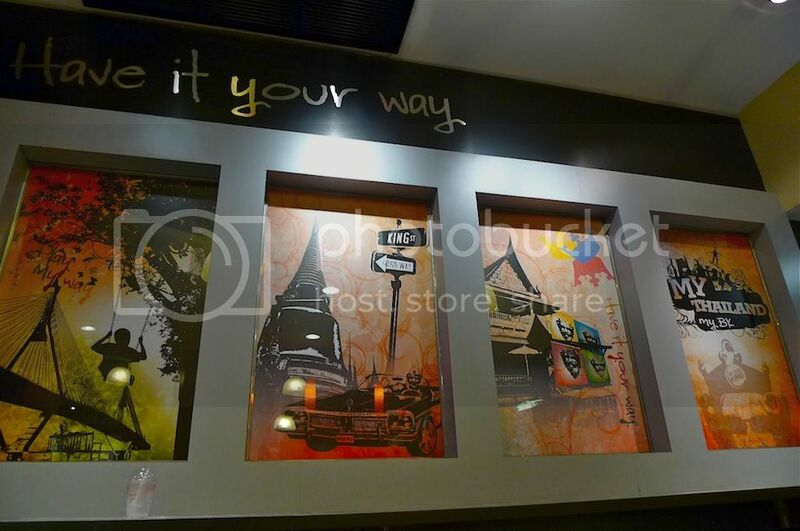 I thought this part of the wall in this Burger King in Silom was really nice! "Have It Your Way" - that's the Burger King's slogan. By the way, the pork burger was delicious! No regrets at all giving it a try. Going around Bangkok city is such a breeze with its efficient MRT (underground train) and BTS (elevated Skytrain). But it can be pretty lonely walking in the underground stations especially late at night. 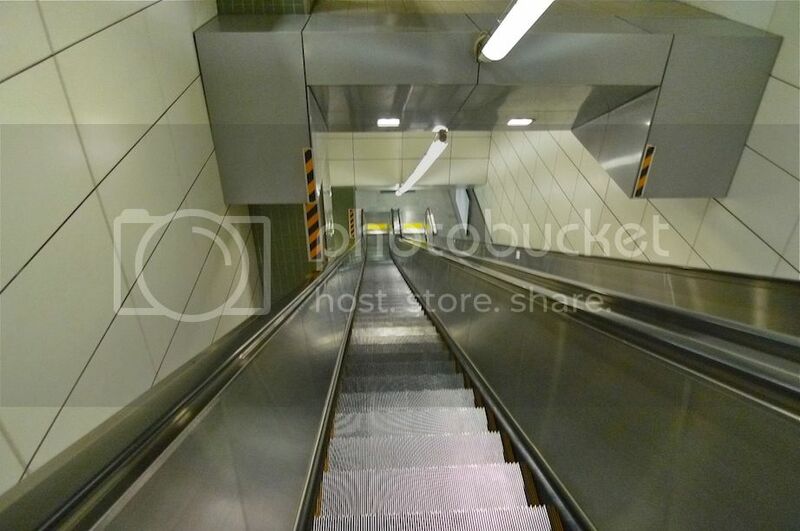 I took the above photo one night on the long escalator in the MRT station. Do you think I was going up or down? 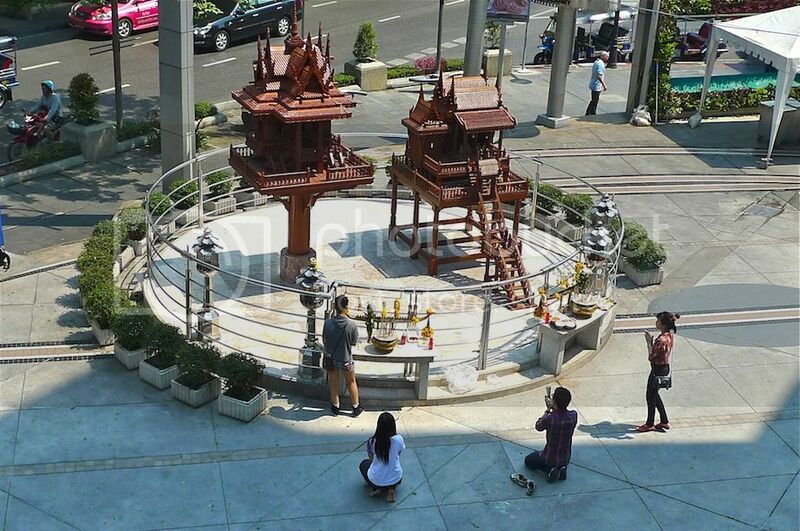 There are many shrines all over Bangkok. Like this one. You can see lots of local people and even tourists lighting incense and praying at these shrines. Of course, the most famous is Erawan Shrine which every first timer to Bangkok must visit! 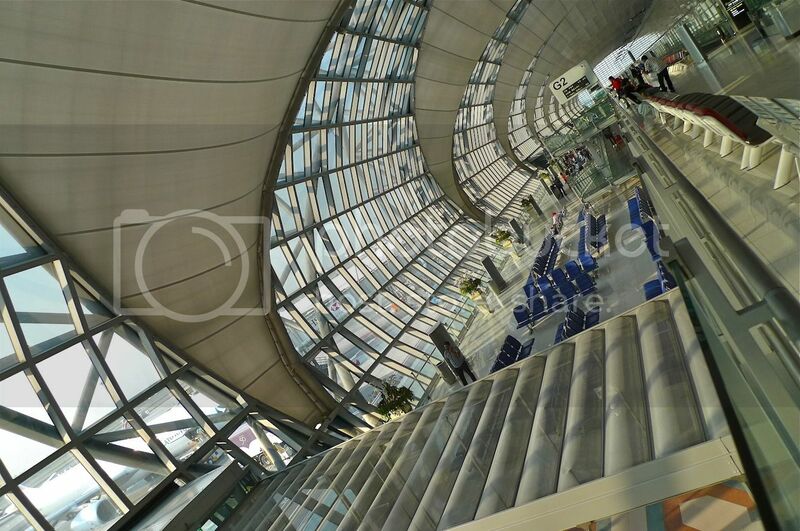 Although I don't really like airports, I find Bangkok's Suvarnabhumi Airport to be quite nice! In case you do not know, it's pronounced as Su-van-na-phum. This is the main international airport serving Bangkok and it has the world's tallest free-standing air traffic control tower at 132.2 metres! Sadly, there had been some overload problem and effective 1st October 2012, budget airline AirAsia no longer lands at Suvarnabhumi Airport. 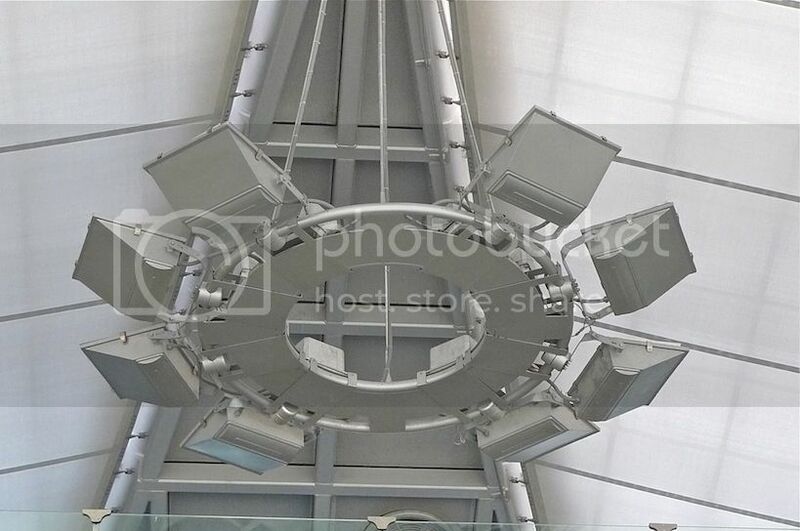 Instead it will be moving back to the older Don Mueang Airport. During my last day in Bangkok, my friend and I were a little late to reach Suvarnabhumi Airport to catch our flight home. Luckily, we managed to check in our luggage with an hour to spare! So we decided to use up our remaining Thai baht dining at Mango Tree restaurant. 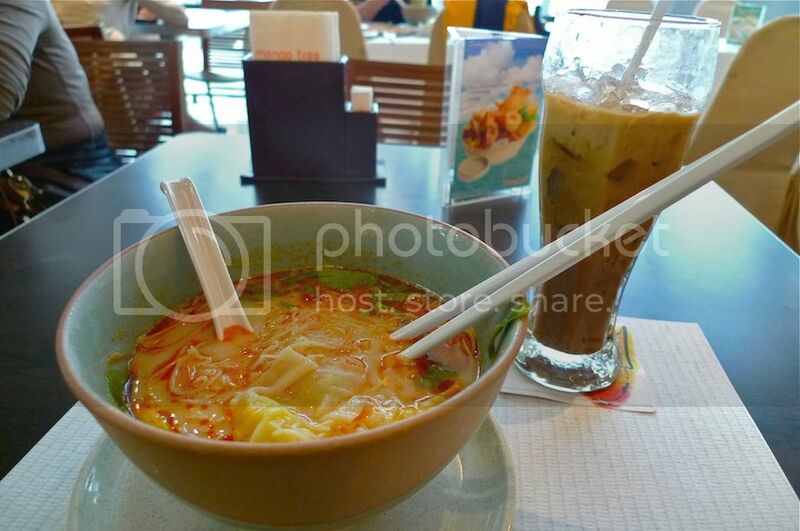 I ate Tom Yum noodles and drank Thai ice coffee. The Tom Yum noodles was quite nice but I thought it was too pricey at 210 baht (USD 6.80) while the ice coffee was priced at 120 baht (USD 3.90). My friend ate fried noodles with chicken (sorry no photo) and drank ice coffee like me. Soon it was time to board our flight back to Malaysia. I really enjoyed my Bangkok trip. And you can be sure I will visit Bangkok again in the near future! 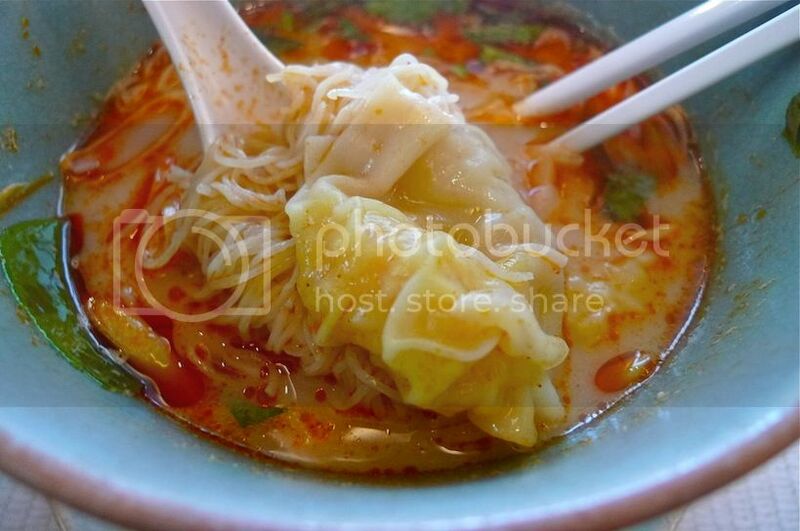 In case you missed any of my Bangkok 2012 posts, here's the complete list. 6. Meet the Sumo Wrestlers At Terminal 21 Bangkok! 15. I Love Thai TV And Thai MTV!